It is difficult to establish the beginning of this tradition. It's possible that pagan worship of wells and water may have been at these same sites. If that is true then the missive from Pope Gregory to Abbot Mellitus, in AD 601, suggesting that pagan temples and sites of worship should not be destroyed but converted for Christian use may have been applied to the Derbyshire wells, it's a romantic thought. The earliest record we can find is from the 'Peak Country' issued by Edward Rhodes in 1818; "..sometimes boards are used, which are cut to the figure intended to be represented , and covered with moist clay , into which the stems of the flowers are inserted". In 2002 Chesterfield's 'Derbyshire Times' announced that wells have been dressed for 350 years! We know for certain that Barlow wells (or at least the 'main' well) have been dressed, year on year, for at least 150 years. Excerpt from Derbyshire Courier September 19th 1846. (1st Barlow Well-dressing? - Wednesday 16th September 1846). 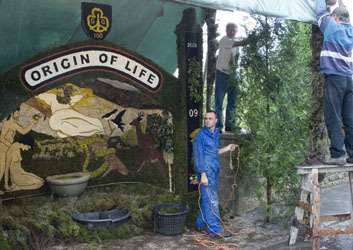 "Barlow Well Dressing – A few years ago, at the expense of His Grace the Duke of Rutland, the public well in Barlow was covered in, and a large pump put down, and the whole enclosed in a very substantial and ornamental manner; and as village well-dressings have within the last few years become the order of the day, the inhabitants of Barlow were determined to establish a similar rural festivity. On Wednesday last, the well at Barlow was beautifully decorated and the village presented an enlivening scene on this their first attempt. In front of the well was erected a large Gothic arch sprung from two poles, one on each side, and from which from which two arches were formed across the pavement in front of the well to two other poles over the road, the whole being very handsomely entwined with different kinds of evergreens, oak branches heavily laden with acorns, hop bines &c. Flowers, for the culture of which Barlow has so long been celebrated, were plentifully intermixed. Over the centre arch was erected the Duke of Rutland’s crest composed of flowers, and the words “Fear God and Honour the Queen” inscribed; at the top was a very handsome crown, also made with flowers. Over the south arch over the pavement was the letters “V.R.” in gold on a green ground; and over the north arch was “Thanks to his Grace” in flowers upon a moss ground, There were also three large splendid arches across the road, one on entering the village from Chesterfield, another opposite the Church yard, and another across the road at the end of the inn. To all these, beautiful garlands were suspended. In the afternoon there was a very large tea party at the inn, when upwards of 80 sat down in a large chamber, most tastefully decorated with evergreens and flowers. The Barlow band was in attendance, and played a many of their favourite airs. After tea, dancing commenced on the green in front of the inn, and as night came on, the well and the front of the inn, were lighted up with candles, which had a most pleasing effect".
" Well dressing in its present form is thought to date from 1350 when the whole village of Tideswell escaped the ‘Black Death’ because of the purity of the water in its five wells. " In 1647 there was a terrible drought but the villagers of Tissington were served by their wells throughout, thus giving rise to another theory. Certainly both Tissington and Tideswell are accepted as being two of the earliest of the Derbyshire villages to dress their wells in this way, Barlow starting very soon after. There is no definitive way that the wells are dressed in Derbyshire and to state that this is the way that welldressings are done would inevitably be inaccurate for another village. 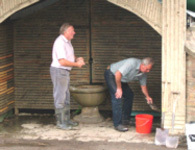 This is a description of how the wells are dressed in Barlow where tradition dictates that we should only use things that grow, that we use the full flower head (not petals) and we dress the well in situ (many well dressing panels are dressed offsite and taken to the well site when they are finished). 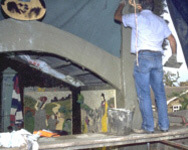 During the time that the work is carried out a tarpaulin is draped in front of the site. 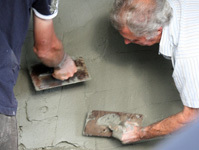 The reason for this is to keep out the wind in order to keep the clay moist not because of shyness or secrecy. In fact anyone venturing behind receives a warm welcome and will probably be roped in to fetch some flowers. Early in the year the team get together to decide what the theme and the pictures will be. 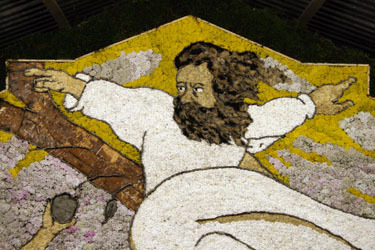 These are chosen from illustrated storybooks or calendars and are often of a religious nature. Once the fighting is over and the blood and spit is mopped up the accepted four (pictures) are given to someone with the necessary skills to draw them full size. The artist is charged with making outline drawings ‘actual’ size bearing in mind the problems presented to the dresser working with flowers. The ‘Main’ well at Barlow often takes the form of a triptych and is thought to have been inspired by the beautiful Dutch Memling triptych painting at Chatsworth House. Sometimes though there will be four or one large 'wrap around' picture. 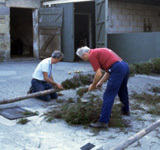 The site is prepared during the week before the well is dressed, the frames are erected and the moss and heather are collected. Puddling (mixing) the clay is the first job. 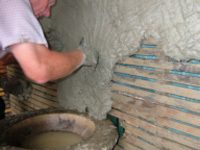 Part of the tradition of the Barlow wells is that the same clay is stored and used from year to year. Most of the clay is 'Victorian' and it was last topped up in 1957. At the present time ‘home’ for the clay is Church Farm. The clay is prepared for use by puddling or treading it until, mixed with water, it is expertly seen to be right. 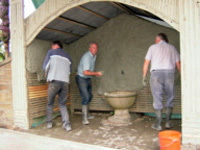 It is then taken to the well where it is applied to the ‘walls’ by hand at a depth of about two inches. The surface is then trowelled smooth. The work begins in earnest on Monday morning at five ‘o clock with the aim to finish the job by Wednesday at noon. 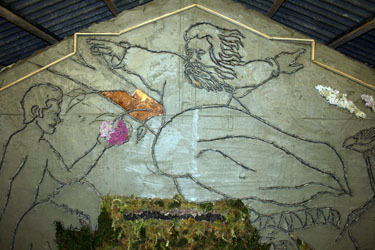 The main reason for the haste is that the clay must be covered with flowers as soon as possible to stop it drying out. Once the thing is done it isn’t touched until it is dismantled. It isn’t sprayed with water as is often suggested, this would discolour the flowers where they came into contact with the wet clay. The flowers shouldn’t be wet when they’re set in the clay for the same reason. 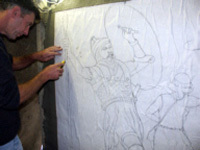 The next step is to place the drawings onto the wet clay then a sharp knife is used to follow the line and prepare for the insertion of larch bark to form the outline. The knives are honed and sharpened ready to be used to cut the paper, cut the flowers and the grasses and to protect your bark from other dressers. Bark is handed down over the years and becomes the responsibility of the individual. Woe betides anyone with their hands in another’s bark box looking for that piece that is just the right size and shape! 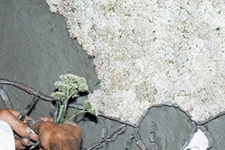 The paper is then removed leaving the bark to show the lines of the picture, flower heads are then pressed into the clay for colour and detail. One of the traditions at Barlow is that whole flower heads are used - not petals, this poses a problem with some colours, blue in particular. Other than flowers anything that grows, grasses mosses and berries, is allowed..
Work on the uprights and the arch is left for as long as possible because this part of the dressing is the most exposed to the weather. When most of the work on the pictures is done the decision is made to start on the uprights. The tarpaulin is removed from the front of the well and scaffolding is erected. The rest of the puddled clay is applied and the tarpaulin replaced around the whole thing. Patterns, including the year date, are depicted in bark, flowers, berries and moss. When the clay is covered the tarpaulin and scaffolding is removed, the site is generally cleaned up and a carpet of heather is laid. 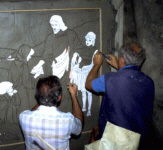 Some pictures taken in 2009 showing the outlines of the picture and colour being applied (and tried). Conifers are erected at the sides to act as windbreaks.